on new Worcester Bosch boilers. by using an accredited installer. My name is Mark Turner and I am the owner of NEWTEC Plumbing. I am based in Farnsfield, Newark, Nottinghamshire and I have over 21 years experience in the plumbing and heating trade as well as being a member of the Chartered Institute of Plumbing and Heating Engineering. We specialise in the design and installation of premium central heating systems. I am Gas Safe registered in Natural Gas and regularly attend the latest technical and practical training courses to keep up to date. 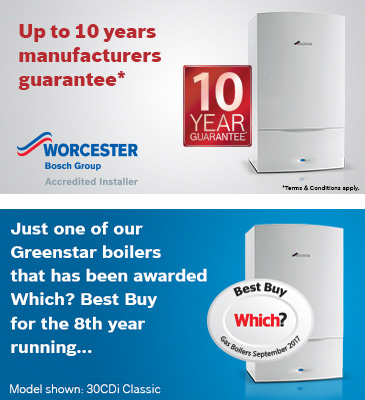 As an Accredited Worcester Bosch Installer I can offer an extended warranty on all Worcester-Bosch products that I install. As a plumbing and heating engineer I endeavour to offer the most efficient service with competitive rates. I am dedicated to energy efficiency & the best products for my customers. I have regular clients who would be happy to supply any references. Worcester Accredited installers are recognised domestic and commercial heating companies that meet or exceed the standards of sustained quality of installation, service and customer care. These installers are accessible through the official Worcester Bosch website. Worcester Bosch ensure our clients receive a high standard of workmanship and professionalism, our accredited companies are monitored by several recognised trade and industry bodies. We provide gas and central heating services to homes and businesses across Newark.